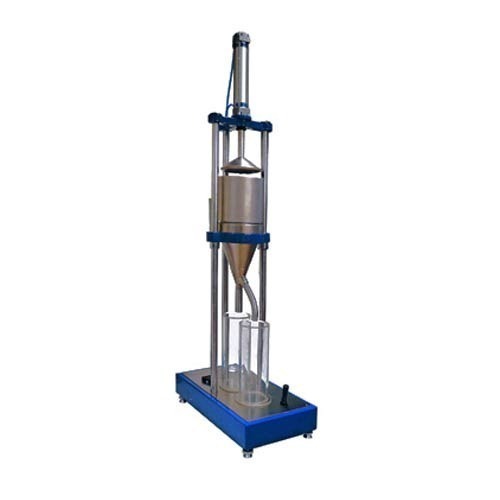 Canadian Freeness Tester provided by us is used for determination of freeness of wood fiber ground wood and mechanical pulp. It measures the Canadian Freeness number which is a measurement of the drainage capacity of different pulp types. It is a useful index of the amount of mechanical treatment given to the pulp with standard screen plate and Plexiglas measuring cylinder for CSF value. 3 gram of OD fiber pulp in aqueous suspension is drained through the fiber mat on a standard perforated screen plate during the test into a funnel provided with a bottom and side orifice. The filtrate collected in specially gruadated measuring cylinder from the side orifice is expressed as a CSF value corresponds to milliliter.